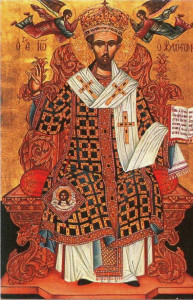 Fr Mark Woodruff of the Ukrainian Catholic Cathedral in London (and alumnus of St Chad’s) will celebrate the Divine Liturgy of St John Chrysostom at St Cuthbert’s on Wednesday 3 February at 7:00pm. This is the form of celebrating the Eucharist (the Mass) in the Eastern churches following the Byzantine tradition, both Catholic and Orthodox. The Ukrainian Catholic Church is the largest of the Eastern Catholic Churches, which are in full communion with the Pope. All are welcome to participate in this celebration of the Divine Liturgy, which will be sung in English and will last a little over an hour. We will be celebrating the “after-feast” of the Encounter of Our Lord in the Temple – i.e. a special liturgy for the day following the Feast of the Presentation. Those normally able to receive Holy Communion at Mass may receive Holy Communion at the Divine Liturgy. Please note that in order to allow for preparations for the Divine Liturgy, there will be no confessions or exposition beforehand.